It’s much more difficult to gauge matchups for a playoff series when even your team doesn’t know who is playing. The Bulls closed out the Nets Saturday without Kirk Hinrich, who gave it a try pregame and couldn’t go, and Luol Deng, who at least got out of the hospital. The hope is Deng will be able to get back for the Monday opener while Hinrich may take until the team returns to Chicago later in the week. Miami led the league playing a relatively small lineup with Chris Bosh sort of a center, though he mostly plays on the perimeter. Perhaps the closest they have to a center is late season pickup Chris Andersen off the bench. The Bulls generally play Boozer against the lesser scoring front court player, who would be Udonis Haslem with Joakim Noah chasing Bosh outside. So there are plenty of crossmatch possibilities. Deng usually plays LeBron James, but perhaps with his weakened condition Jimmy Butler will help out after versatile perimeter defense against the Nets. Here’s how it could look to start, of course, subject to change. The Bulls eventually plan to have Hinrich back from his calf injury, perhaps even for Game 1, though the date remains uncertain. Robinson played Deron Williams in the first round and not very well, which is hardly his fault. The Bulls eventually went more to Butler, who was effective in limiting Williams late. But no one will ever forget Robinson’s Game 4 show to set up the triple overtime. This is a better matchup for him given Chalmers isn’t a scorer and Miami doesn’t use him to set up the offense or break down the perimeter defense, which is LeBron James’ job. Robinson hit big shots throughout the last series and gives the Bulls an offensive weapon they need. 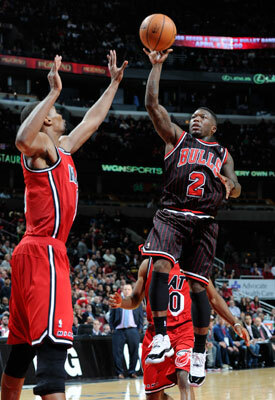 Edge: Bulls (yes, I’m giving an edge to Nate Robinson). It’s a Marquette Hall of Fame. OK, a bit soon for Jimmy. This also depends on whether Deng can play. If he cannot, Butler probably moves down to small forward against James with Marco Belinelli, a better offensive player than defender, on Wade. Butler has become a vital defensive presence for the Bulls, and there is mystery surrounding Wade, who sat out the end of the Milwaukee series and late in the season with knee problems. He’s said to be improved, but he also has had many of his poorer games against the Bulls and their defensive play. He’s perhaps the X-factor in this series. You know what you will get from James. If Wade plays at a high level it’s tough for anyone to beat them. This is the Michael Jordan matchup. LeBron picked up his fourth MVP Sunday and really is more than a one position advantage. There were series with the Bulls where the teams had three or four position advantages. But the Bulls had Jordan, which made up for a lot. James is like that as he can dominate a game. 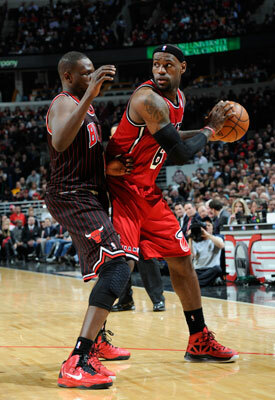 Deng does as well against him as any given the Bulls are not a team that likes to double team. But Deng could be weakened from his bout with a virus and hospitalization. Assuming he even plays. Boozer has had some big games against the Heat, especially in Miami where his children live. He’s become a vital offensive contributor for the Bulls in Rose’s absence, though he struggles to get the ball at times when Robinson is at point guard. He plays well off Hinrich and Belinelli also is a good post entry passer who’ll be patient enough to find him. Boozer’s aggression has picked up considerably this season as he’s been healthy and in better condition than ever as a Bull. Haslem is sort of spot starter for defense as the Heat will go to Birdman Andersen for size. The book always has been to play size against Boozer, but he’s been more adept with drop step moves though he prefers his jump shot. His work on the boards against Haslem could prove decisive. This is as unclassic a center matchup typical of today’s NBA where Bosh will mostly float outside as more a power forward type player while Haslem handles the post grunt work, though not on offense. Bosh had strong playoff games against the Bulls in 2011, though he doesn’t particularly care for the rough stuff and isn’t much of a rebounder. Noah is coming off one of the great games of his career in the clincher in Brooklyn in which he drove the Bulls to victory as much as Jordan ever did. He’s got a history with James, whom he challenged in Cleveland once when James was dancing around in a Cavs blowout win and brings as much emotion and passion to the game as anyone playing. He says his plantar fasciitis is in remission, which will be vital for any chance the Bulls have. Bench: It would help the Bulls if Hinrich can play along with Deng, which would put Belinelli and Robinson in reserve. Though Richard Hamilton didn’t play against the Nets and even was replaced by Daequan Cook in Game 7, he could see some time against a veteran like Ray Allen or even Wade in this series. Taj Gibson has struggled since coming back from his second sprained MCL and never has quite regained his previous play with inconsistent explosion off the floor. The Heat has the reserve X-factor in Ray Allen, who has been big time playoff performer and is one of the best ever in finding open space to shoot. The Heat landed a good one in Andersen given their small lineup, which is a disadvantage against the Bulls. Miami also has a strong veteran defender and shot maker in Shane Battier with Norris Cole maybe giving Robinson someone to postup. Coaching: Miami’s Erik Spoelstra has earned his way into the ranks of the better coaches with the way he’s stood up and brought along Miami and has them consistently playing at a high level. He’s also been innovative in using various lineups, though James’ versatility makes it all possible. But it’s tough to favor anyone against Tom Thibodeau, who has done a terrific magor act with injuries, changing lineups and rotations and never quite knowing even who will be playing for how long. Pick: If you want to be the champion you may as well be tested. The Nets weren’t going to be a test for Miami after the Bucks. Not that the Heat will see a defensive team like the Bulls again, perhaps unless they meet the Spurs. Lots of ifs with the Bulls about health and, of course, Derrick Rose. No one among the Bulls expects him to play, though they were certain Michael Jordan never would come back after 1993 because he told them he wouldn’t. You never say never when one person can make a decision. Not that this stuff matters in making plays, but the Heat is the favorite to repeat. The Bulls again are missing their best player and have myriad injuries. Isn’t the pressure on Miami not to lose to a team like the Bulls? Aren’t the Bulls playing with so called house money as the gambling term goes as you went farther than anyone imagined? Great players don’t think of those things. The difference will be whether Wade is healthy and productive. If he’s not and the Bulls can isolate James and let him have big games it might not be enough in what should be a tough series.